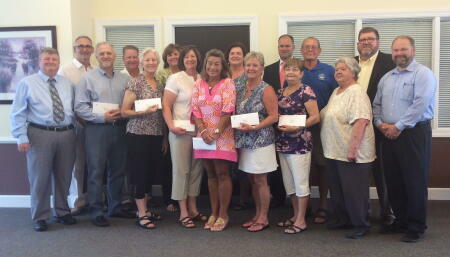 Members of the board (back row) pose with grateful grantees (front row) having just received their funding. The Columbus County Community Foundation was established in 1999 to help donors create and build endowments to meet their philanthropic goals; make grants to local nonprofit organizations; and support community needs in Columbus County. The Columbus County Community Foundation is an affiliate of the North Carolina Community Foundation. For further information, contact NCCF Regional Associate Angie Brewer at 910-509-7256 or abrewer@nccommunityfoundation.org.